Debt is often considered a bad thing, and much of the time it is but not always. Dave Ramsey gives great advice and I’ve incorporated much of his wisdom into writing this blog. However, one topic where I disagree with his views is debt. Mr. Ramsey believes that all debt is dumb and is not a tool to build wealth. Debt can be a powerful tool for building wealth, but it is a requirement to understand the difference between good debt and bad debt. I like the analogy of viewing debt like a gun – it can either save your life if used properly or it can kill you. One of my financial mentors, Robert Kiyosaki, scratches the surface of good debt vs bad debt in this one minute video (I would watch this video before reading further). As he explains, good debt will put money into your pocket every month and bad debt will take money from your pocket every month. Examples of bad debt include credit cards, automobile loans and a mortgage for your personal residence. Student loans can be either good debt or bad debt, depending on your current employment status. If your current job does not require a degree, your student loans are bad debt. If your career requires a degree but expected pay from said career doesn’t warrant the costs associated with a degree, your student loans are bad debt. Bottom line: you want to avoid these types of debt when you can because they will be a huge roadblock for building capital and ultimately, a huge roadblock for financial freedom. With a down payment of $40,000 (or 20%), you could hypothetically purchase a $200,000 home with a $160,000 mortgage (for people in living in California, you likely won’t find a rental like this but you can find them out of state). Because you can rent out the home for $1,800 per month, this will cover your mortgage of $858 and other expenses with the home. The result is a $439 per month positive cash hitting your bank account every month. The $160,000 of debt is paying you $439 per month, which is why this would be considered good debt. 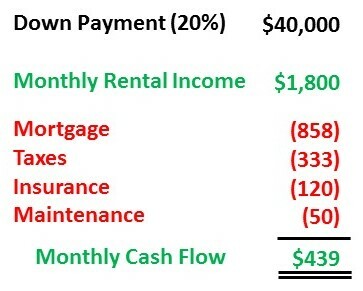 In addition to the $439 per month you are collecting, your loan balance is also being paid off by your tenant, which increases the equity in your home and ultimately, your net worth as well. If you are not sure whether a debt you have is good or bad, just determine if said debt is putting money into your pocket every month or draining your wallet. It really is that simple. If you come to the realization that you have bad debt, it is not the end of the world. Make a plan to pay off your bad debt as soon as you can. And a disclaimer: I would strongly advise against entering the rental real estate market without proper education and a mentor.